This entry was posted on October 9, 2013, 1:26 pm and is filed under Guantanamo, protest and resistance, torture. You can follow any responses to this entry through RSS 2.0. You can leave a response, or trackback from your own site. but remains in Guantánamo. He has been described as a charismatic leader who spoke up and fought for the rights of fellow prisoners and some have speculated that this might be a reason for his continued detention. 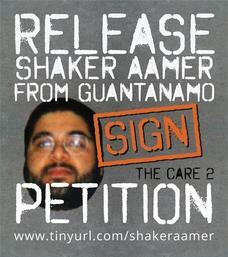 Aamer says that he has been subject to torture while in detention.